On Sunday, January 11, Bertha Singini and Benjamin David answered an invitation from First Congregational Church in Sheboygan to speak at an Adult Forum educational session prior to the 10 a.m. worship service. These sessions are offered by the church every Sunday morning on a variety of topics in order to raise church members’ awareness about issues of both local and global importance. At a recent session, Pastor Jim Hollister shared information about his trip to The Holy Land, where he gained new insights about the Israeli-Palestinian conflict. On January 11, the topic for the session was “Early Grade Reading in Malawi: A Way Forward.” Eighteen church members attended, and afterwards, commented that they were moved by what Benjamin and Bertha shared about the challenges facing young learners in Malawi. Benjamin began by presenting basic information about the size and population of Malawi. He shared that there are 17 different ethnic groups within the country, each one speaking its own local language. While Chichewa is the national language, and English is the official language, there are many other languages spoken amongst the nation’s 16 million inhabitants. For some children, English is not just a second language, but sometimes it is the child’s third language. Benjamin and Bertha described the various difficulties faced by Malawi’s educational system: large class sizes, lack of indoor classroom space, lack of book resources and other educational aids, lack of assessment, and in many cases, a lack of well-trained teachers. They explained that soon after the government changed in 1994 from a single-party to a multi-party system, education became free to all children, and many more girls started attending classes. One repercussion of this sudden increase in school populations was a decrease in the quality of teaching available to students because there were not enough trained teachers to go around. Malawi’s education sector has been trying to catch up ever since. During the church presentation, the LC graduate students did not focus only on their country’s challenges, of course. They shared a list of initiatives they hope to champion when they return home. At the top of their list is developing new ways to involve parents in their children’s learning process, including teaching parents to read themselves, when that is necessary. Also on their list were ideas about raising the bar for teacher training and bringing to their colleagues and students at the Teacher Training Colleges the best practices for teaching reading across the entire curriculum. Bertha and Benjamin also mentioned that the Lakeland graduate students have a vision for creating a “model school” in Malawi that could become a center for promoting and disseminating the best practices in early grade reading instruction. They imagine, as part of this model school, a resource something along the lines of Sheboygan’s Bookworm Gardens. They see a Malawi Bookworm Gardens as an enriching and engaging environment in which children and their parents can learn together. The Sheboygan church members had many questions for the presenters and praised them for their courage and perseverance in addressing the needs of Malawi’s youngest students. This post is written by Lisa Vihos, the Director of Sponsored Programs and Research at Lakeland College. The program is made possible by the generous support of the American people through the United States Agency for International Development (USAID). The contents of this blog are the responsibility of Lakeland College and do not necessarily reflect the views of USAID or the United States Government. I had the pleasure of accompanying the graduate students on Friday, December 19, to Cleveland Elementary School for a music program, “An Eclectic Collection of Holiday Songs.” We were the guests of the school’s principal, Dr. Bill Klein, who is also one of the adjunct instructors in the Lakeland graduate program. He was very happy to welcome the Malawians to his school, and the Lakeland students were very happy to be there. Dr. Bill Klein, far left, with the Malawi students and front office staff at Cleveland Elementary School. Upon arrival, we toured the school building and visited the front office, the library/computer lab, the art room, and two classrooms, one for kindergarteners and one for second graders. 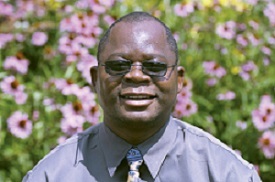 In each classroom, Dr. Klein introduced the Malawians to the children and explained that these visitors were his students at Lakeland College and that they had come to study in the United States from a place very far away. He explained that the country of Malawi was on the continent of Africa, and he asked the children if they could tell him how one would get to Malawi. “Could you use a car?” he asked. The children were quite sure a person would need either a boat or a plane. The Malawians had front row seats for the concert, where about 250 parents had gathered in the gymnasium to listen to their children sing. The music director at Cleveland is Lisa (Landwehr) Whelton, who is a 1988 alumna of Lakeland’s music education program. She led the children, from kindergarteners through fifth graders, in a lively program that featured many fun and energetic holiday songs. 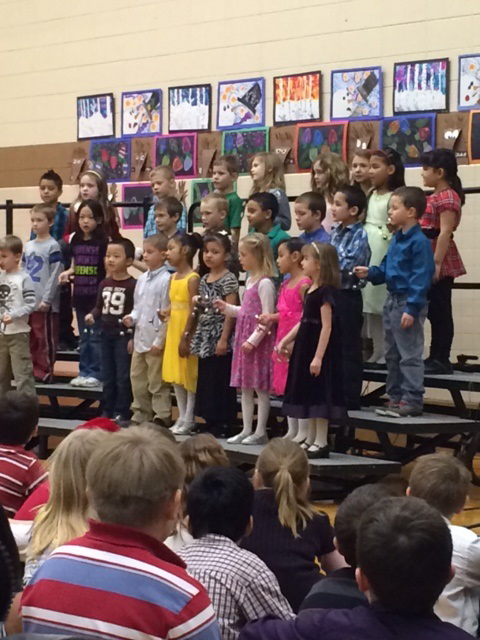 The children added percussion, hand gestures, and body movements that created an uplifting and entertaining show. You didn’t need to be related to these children to enjoy their performance. That’s how good it was. I asked the graduate students afterward about music in schools in Malawi, and I learned that children do sing in school, as part of the “expressive arts” curriculum. What the Malawians found most impressive about the activity we had just witnessed at Cleveland Elementary was the involvement of parents. It really struck the Malawians how great it was that parents would take time to be present for their children in this way. In addition, they were curious about the fact that public school students do not wear uniforms (as they generally do in Malawi). Phillip Nachonie pointed out how important it is to teach children things and then give them the opportunity to show off what they have learned. Everyone agreed that this opportunity to “show off” would be something to take home to Malawi with them. One final highlight of the day was at the end of the concert when we met with Lisa Whelton and a fourth grade teacher, Dawn Wood, who is a 2009 alumna of Lakeland’s M.Ed. program. It was a lovely moment to have these two LC alumnae exchanging stories with the Malawian students about favorite professors: Khodavandi, Elder, Homstad, and Schilcutt to name a few. There was much laughter, a sense of camaraderie, and the invitation from Dr. Klein to return to the school in the future. It was such a wonderful afternoon. What better way to celebrate the Christmas season? Songs were sung, cookies were shared, friends were made. The graduate students with Lisa (Landwehr) Whelton '88 at far left and Dawn Wood '09 at far right. Bertha Singini with two new friends, Christopher and Jacob. 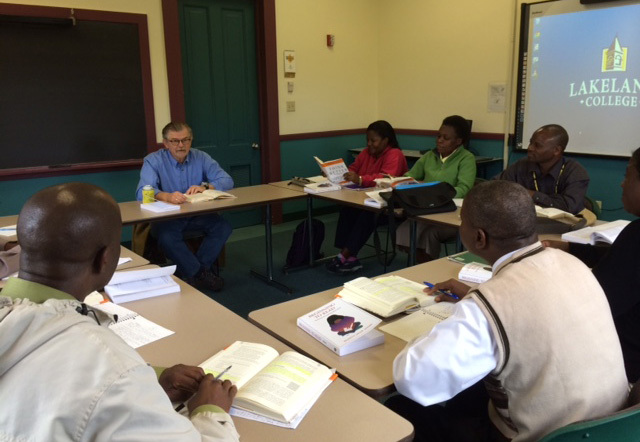 The Malawi graduate students have come to the end of their second term at Lakeland. The last few weeks have been a time of continued study, exams, papers, and planning ahead. What the students are most focused on now is how to leverage their knowledge to implement systemic changes in the way reading is taught to young learners in Malawi. They have identified who their different audiences will be when they return home, including everyone from officials in the Ministry of Education, Science, and Technology, to staff at the Teacher Training Colleges; from current teachers and parents to the learners themselves. 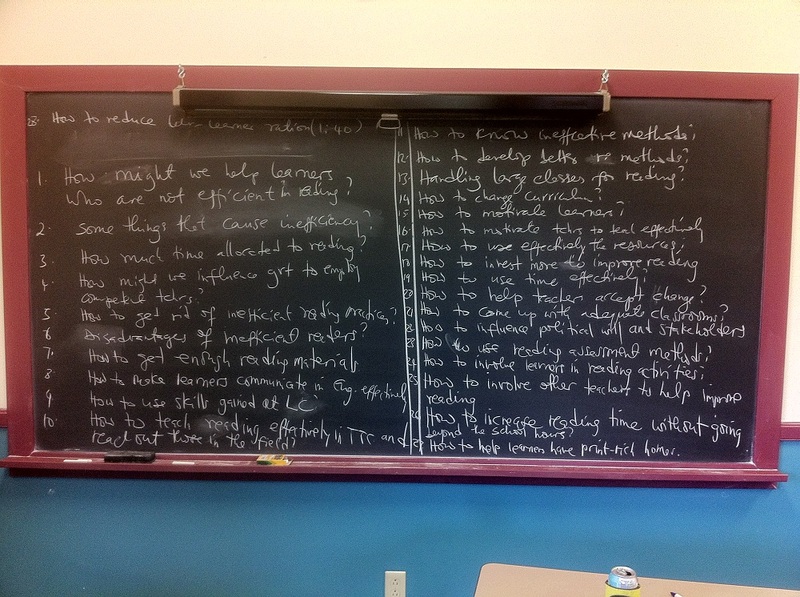 In each instance, the students will need to craft persuasive arguments for change that are tailored to each audience. This is not an easy task, but the Lakeland students seem as passionate as ever and ready for the challenges ahead. Recently, I had a chance to speak with Bertha Singini and Phillip Nachonie about how the group’s thinking is evolving. Today’s post summarizes some of their latest strategizing. How might we help learners who are not efficient in reading? Some things that cause inefficiency? How much time allocated to reading? How might we influence [government] to employ competent teachers? How to get rid of inefficient reading practices? How to get enough reading materials? How to make learners communicate in English effectively? How to use skills gained at LC? How to teach reading effectively in the TTCs and reach out to those in the field? How to know ineffective methods? How to develop better reading methods? Handling large classes for reading? How to motivate teachers to teach effectively? How to use effectively the resources? How to invest more to improve reading? How to use time effectively? How to help teachers accept change? How to come up with adequate classrooms? How to influence political will and stakeholders? How to use reading assessment methods? How to involve learners in reading activities? How to involve other teachers to help improve reading? How to increase reading time without going beyond the school hours? How to help learners have print-rich homes? Bertha and Phillip explained that the group took the 28 problems and organized them into five categories: Learners, Time, Stakeholder Involvement, Effective Methods, and Resources. The students then examined which things can be implemented through their direct sharing of information and skills with TTC teachers and teacher candidates individually and which things are larger in scope and will require the assistance of administrators and policy-makers in order to be implemented throughout the education sector. Informed by Hurson’s methodology for using innovation and problem solving as presented in his book, the students continue to identify “assisters” and “resisters” within the current system, in order to create the new outcomes they seek. By anticipating what the road to innovation and subsequent improvement in literacy levels in Malawi will look like for these agents of change, the students believe they will be able to assist in improving early grade reading instruction in Malawi for many years to come. The weather is turning much colder here, and it appears we’ll be having an early winter in this part of the world. So far, we've escaped the snow that has hit other parts of the region, but we know it is coming soon. When I run into the Malawians on campus these days, most are wearing their winter coats and wool hats, and when I ask the students how they’re faring, they tell me they are doing well. “Reading and writing,” they say, “more reading, more writing.” The students of Cohort 1 are just about halfway through their time at Lakeland. 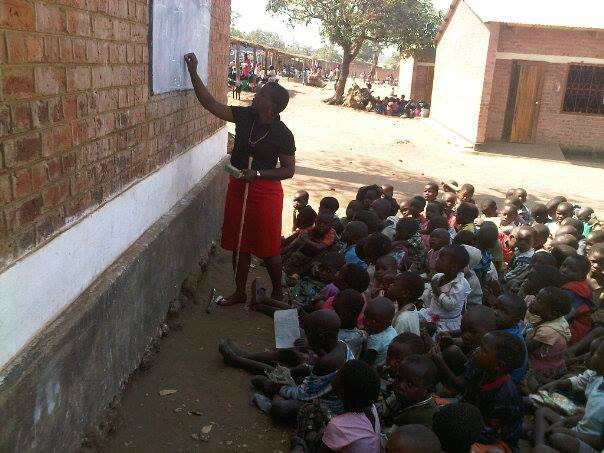 Recently, one of our Malawian graduate students, Bertha Singini, shared with me some photographs showing one of her former students teaching a class. Miriam Nyasulu was a student at Lilongwe Teacher Training College and is now a teacher at Tsabango Primary School in Lilongwe. In Miriam’s Standard One class (the equivalent of the first grade in the U.S.) she has 137 students. There are twelve other teachers in Standard One at Tsabango Primary School, and each teacher has over 100 children to teach. Bertha reports that in the entire school (grades 1-8) there are 11,000 children and 160 teachers. The school’s population is enormous and space is limited, so 48 of the classes at Tsabango have to meet outside, as in Miriam’s case. For many classes, students learn while sitting under a tree or beside the wall of one of the classroom buildings. When it rains (which happens frequently from December to March), those students taking their classes outdoors have no choice but to go home. Bertha tells me that most learners in Malawi are in the earlier grades, and the number of students per grade decreases as the children get older. Going to school must be a rather frustrating experience for most learners, so I wonder if children end up “dropping out” at an early age because it is so difficult to make progress in such a trying learning environment. Already, there are few books per class and virtually no supplementary educational materials, so overcrowding in their classes only makes the students less able to learn and therefore less interested in learning. 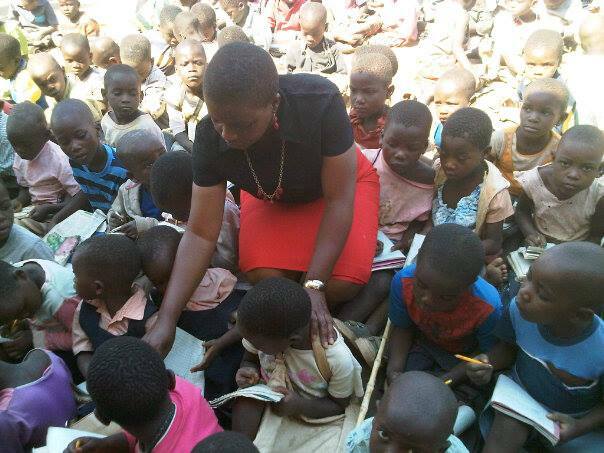 The photos Miriam shared with us tell a great deal about the current state of affairs for teachers and students in Malawi. They also remind us of the enormous challenges that the Lakeland graduate students will face and are preparing to address when they return home. Recently, Karon Harden, a consultant from RTI International (a major global consulting firm with headquarters in North Carolina and Washington DC), came to Lakeland to meet with the graduate students for a two-day exploration into the Early Grade Reading Assessment and the Early Grade Reading Activity (EGRA). The assessment program has been instituted in other African countries to measure literacy levels, and the collected data show that improvements are taking place due to follow-up interventions through the subsequent Early Grade Reading Activity. All of the M.Ed. students came away impressed with Karon’s knowledge about reading programs and her experience in Africa. One thing Karon shared with the students was a rubric called The Five Ts, which is described below. I’m also happy to pass along some of what the graduate students came away with from the workshop, expressed in their own words. The following summary was submitted by Ndamyo Mwanyongo: “One of the significant things that I learned at the RTI workshop is “The 5 Ts”. These are Time, Teaching, Text, Tongue, and Testing. Learners are supposed to be given more time to read so that they have a good foundation. Teachers should use good teaching techniques that will help learners learn to read. Activities done by teachers and learners should be well distributed so that learners practice more. Teachers succeed in this by considering some clues like: “I do,” “we do,” and “you do.” Thus, the teacher demonstrates, then does it together with the learners, then finally lets learners practice on their own. Learners should be given more chance to use the text for reading. They should be encouraged to read even outside the classroom. Learners should be allowed to express themselves, and to be assisted in their mother tongue. This helps them to understand the concept easily. Michael and others reported that much of the discussion focused on essential early literacy components, such as phonemic awareness, alphabetic principles, vocabulary, fluency, and comprehension. The M.Ed. students were also shown video clips of teachers implementing these techniques. Bertha Singini told me that she learned a lot from watching and discussing the video clips. Their task was to identify and talk about each “real” lesson and to think about what was working for the teacher and why. What was the teacher in the clip doing that led to success? 1. Consider what to do in the curriculum, like giving reading more time in the early grades. 2. Emphasize the best practices of teaching reading in Teacher Training Colleges, such as full courses in phonemic awareness, phonics, vocabulary, fluency and comprehension. 3. Give the teachers efficient knowledge and enough practice on the way reading should be taught in early grades. 4. Guide the Ministry to initiate effective monitoring and evaluation systems that will reinforce trainers' efforts in improving teachers' work in the schools. 5. Find mechanisms and strategies of dealing with teaching and learning problems that arise due to large classes. 6. Find research-based methods that can help to improve teaching in elementary grades. 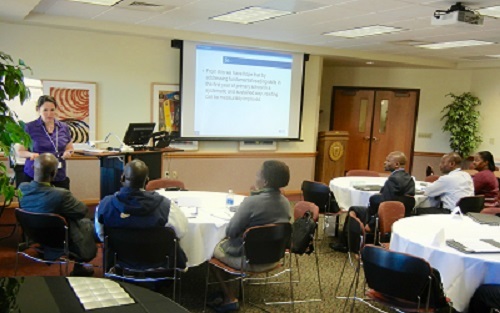 Through their Lakeland classes, their interactions with Wisconsin teachers, and workshops like this one with Karon Harden, the Malawian graduate students continue to build on the knowledge and skills they will use as reading specialists in Malawi. 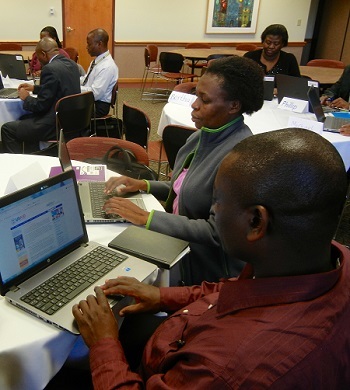 Not long ago in September, the Malawian graduate students joined an online workshop sponsored by USAID. The title of the webinar was “Incentives and Accountability in Education.” Participants were able to connect via the Internet from across the globe and listen to presentations taking place in Washington D.C. The presenters shared information on using incentives to improve both student and teacher performance with early grade reading. One exercise during the workshop dealt with a hypothetical situation in Malawi, and the students found this to be a very useful learning activity. 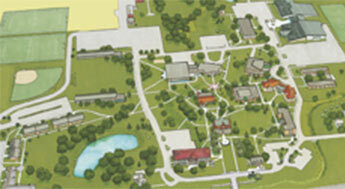 In fact, the exercise may be expanded as part of a visit to campus by an early grade reading consultant in spring 2015. In the coming months, the Malawians hope to learn more about technology and the possibilities it affords as far as creating inter-connectivity with knowledgeable experts in early grade reading around the world. This week, on October 9 and 10, the college will host a visiting consultant from RTI International in Washington DC. Karon Harden brings considerable experience working with early grade reading initiatives in Africa. I know the graduate students are looking forward to her visit as they continue to seek solutions to the challenges of teaching reading to young learners in Malawi. With today’s post, we have finally met all of the graduate students from Malawi. It has been more than three months since the group arrived on campus. The students are keeping up with their reading and writing assignments, and also managing to fit in some occasional off-campus activities like attending a poetry event in Sheboygan this past weekend. Let’s meet Elymas Tembwe and learn about his plans for forging a productive future back home. Elymas is from the capital city of Lilongwe, and he received his bachelor’s degree from Domasi College of Education in 2010. Upon graduation, he went to work at the Teacher Training College (TTC) in Machinga in southeastern Malawi, where he is still employed. His wife teaches at a “commuter” high school, which means that the students come from many surrounding communities on foot or bicycle each day. Elymas and his wife have four children: three girls, ages seventeen, nine, and six, and a boy, age fourteen. For his master’s thesis, Elymas is planning to explore the impact of graphic organizers as a strategy to enhance reading comprehension. He explained to me that a typical graphic organizer would be a Venn diagram, two overlapping circles. Using such a tool, learners can explore a text by organizing the relationships between things in a visual manner, which increases overall comprehension. This past summer, when Elymas first arrived in Wisconsin, I asked him what had surprised him most about his new home. At the time, he said he was surprised to find that people are extremely helpful and friendly here. He felt very welcomed, and he greatly appreciated all the kindness shown to him and his fellow students. When I recently asked him again what things have surprised him, he became energized and told me about a book he is reading in Karl Elder’s class, Means for Mastery of Reading Pedagogy. The book is called Think Better, and in it author Tim Hurson outlines a step-by-step method that groups of people can use in order to work toward solutions to complex problems. The steps involve what Hurson calls “productive thinking,” as opposed to “reproductive thinking,” which is what we generally engage in when trying to move past challenges or difficulties. attended the global event “100 Thousand Poets for Change” at Glas Coffee House along Sheboygan's riverfront on Saturday, September 27. Michael Simawo took the photograph. Ndamyo shared a poem written by the writer of this blog, translated into Chichewa. I had the opportunity to drive three of the graduate students into Sheboygan last Friday evening to attend a concert of the African Children’s Choir at St. Luke’s United Methodist Church. 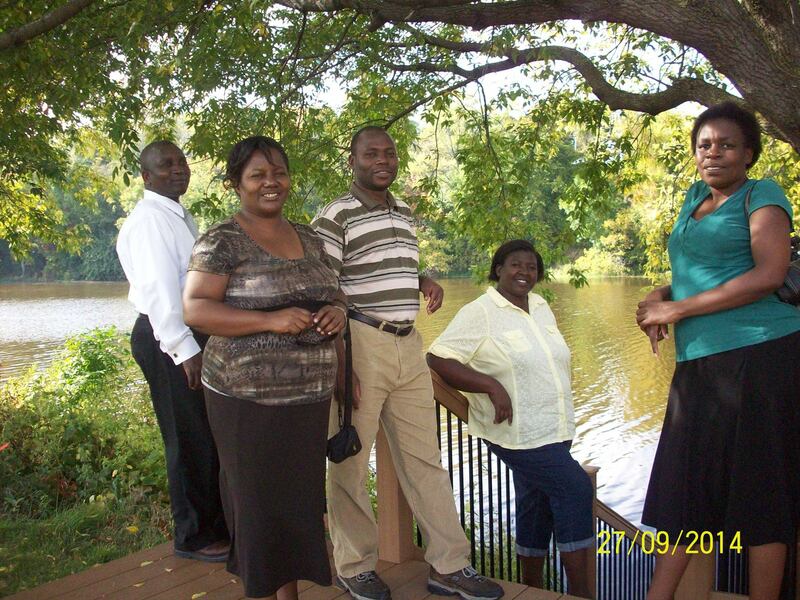 The choir was from Uganda and was on a grand tour of the United States. The children, most of them orphans, were wonderful singers and dancers, full of talent, vitality, and smiles. The whole experience was very uplifting, and it was good to do something away from campus with Ndamyo Mwanyongo, Margaret Mulaga, and Bertha Singini, the subject of today’s profile. I think the three graduate students had a good time listening to familiar music from Africa, as I occasionally heard quiet singing coming from Bertha, who was sitting next to me in the pew. Bertha was born in Mzuzu, in northern Malawi and lives now in Blantyre, in the south, where she has worked at the Teacher Training College (TTC) there for five years. 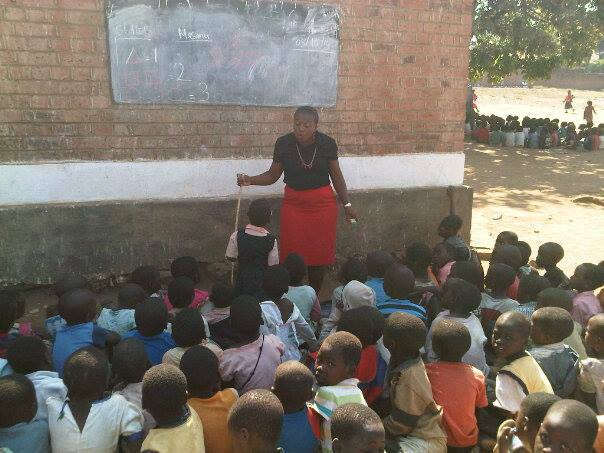 Before that, she taught for eleven years at the TTC in Malawi’s capital, Lilongwe. 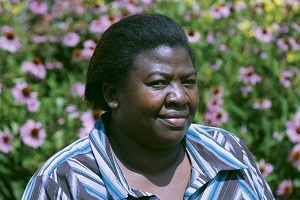 Prior to Lilongwe she was working on her bachelor’s degree at the University of Malawi, Chancellor College. Bertha, along with several of her fellow M.Ed. students, would like to see discussions opened up with the Ministry of Education back home to create an office strictly dedicated to issues related to teaching reading. She also has a vision that more books could be made available for children to take home with them to read during their free time. Her graduate thesis will examine how literacy skills can be used in other content areas in the primary school curriculum, for example, in social studies. Bertha still thinks about her visit to Bookworm Gardens that took place during the first two weeks that the Malawians were here, and it remains one of her favorite experiences in Wisconsin to date. Although she knows that resources would be an issue in building a similar activity center in Malawi, and that a Bookworm Gardens there would be very different from the one here in Sheboygan, she can imagine something like it back home. “We just need to identify a place,” she said. One of the most striking things to me about Bertha is that she is full of laughter. While she can be quite serious when talking about the important things that matter to her, her words are often prefaced by laughter, which seems to burst out at times in a cascade of joy. Being able to laugh easily no doubt serves her well, when days become stressful and there is so much important work to be done. I continue to think about what it means to be an effective teacher. Last week, I wrote about the need for passion. As I continue getting to know the graduate students, I think that every effective teacher is also a determined, life-long learner. A teacher must continue to expand his or her own knowledge in order to be effective at expanding the minds of others. There is constantly new information and skills to learn and new ways to learn those things. Even when teaching the basic skills--such as reading and writing--a teacher must be prepared to try new methods and bring in new examples in order to reach his or her students. Overton Simbeye is determined to use these sorts of strategies in order to engage young learners in Malawi, and he emphasized this fact when we spoke recently. Overton Simbeye works at the Teaching Training College in Karonga. His wife is a primary school teacher, and they are raising seven children, three from a first marriage. Overton tried to come to Lakeland in 2003. This was during the eleven-year period when the college was admitting Malawians in cohorts of five students each year to obtain bachelor's degrees in education. He was not selected that first time, but he was determined to get a college education. So instead of Lakeland, he pursued his bachelor's degree at Domasi College of Education in Malawi. When the opportunity arose to participate in an M.Ed. degree program in early grade reading instruction at Lakeland, he was extra determined to be accepted into the program. This time he was accepted, and he says he is very glad to be here. Overton told me that his thesis project for the degree will examine the effects of scaffolding techniques on young learners. I was not familiar with the concept of "scaffolding," so he explained it: "Scaffolding activities make teachers and learners focus on reading by placing it into a context." For example, before students read a new text in class, the teacher might first set the stage by walking the students through some guided imagery to help them visualize what they already know and think about the subject described in the text. By preparing them to read in this way, the teacher shows the students how the reading itself becomes more meaningful. Consequently, there is better comprehension and more retention of the text. Overton further explained that another good strategy is to read in "chunks," and to stop periodically and talk about or reflect on what has been read along the way. He is looking forward to trying out various techniques like these in Malawi and observing what works best for young learners there. One thing that has impressed Overton since he came to study at Lakeland is how generous people are in Wisconsin. "We have had a lot of invitations from churches and the Rotary Club to visit them," he said. 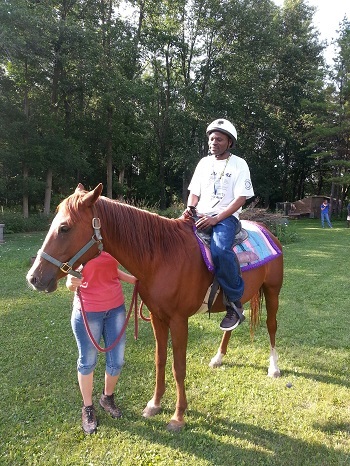 Like Phillip Nachonie, Overton remembered fondly a recent afternoon at the home of Pastor Brian De Jong, when all the graduate students got to ride the horse. Overton has been touched by the openness and generosity he has seen here. He has also noticed that people here are good with time management, and he is eager to impart that concept to his student teachers back home. Overton also shared with me the meaning of his full name, Overton Chitukula Daniel Reuben Simbeye. "Overton" was a name that his father heard a British man in Zambia use, and he was told the name meant "chief." "Chitukula" is a clan name. The next two names are Biblical, "Daniel" (God is my judge) and "Reuben" (Behold my son). Overton’s grandfather’s name was Daniel, and his father’s, Reuben. Finally, the surname Simbeye is a tribal name. Overton said, "When I see all my names, I feel I must try and try and try." Overton looks forward to returning to Malawi and getting to work on making adjustments to the TTC curriculum and improving teacher training. He is determined to see this happen. When I asked him if he thinks the system will change, he said, "I have no doubt. The content we are learning here will help us make a change. We are starting to learn good early grade reading strategies. There are ten of us. We will have the weight [to make improvements in the system]. The people back home are eager for change." Like all skills, teaching is one we can learn. But, it helps if we have a lot of energy, because teaching also requires considerable patience and a large dose of ingenuity. Sometimes, students are not focused on learning. Sometimes, the conditions in which the learning is supposed to happen are not ideal. Either way, a teacher needs a lot of resourcefulness to do the job at all. But to do a great job, there must be energy combined with imagination. This is passion. Without passion, teachers will not be role models for their students. I’m sure this is what most of us remember about our favorite teachers over the years; they were passionate about their subject and passionate about imparting it to us. I hear this idea about passion come up often when I talk to the graduate students from Malawi. 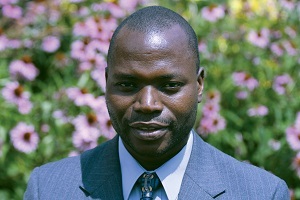 Michael was born in Blantyre in the southern part of Malawi. 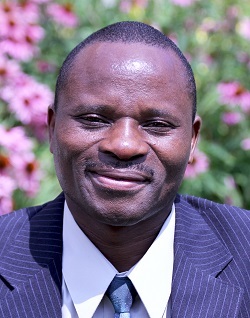 He has taught in Blantyre, in Lunzu, and now teaches at the Teacher Training College in Machinga, alongside two other Lakeland graduate students, Phillip Nachonie (who we met last week) and Elymas Tembwe, whose profile on this blog is yet to come. Michael is married; his wife does part-time data collection work for various non-governmental organizations (NGOs) and also helps care for Michael’s nieces and nephews. They are not the parents of any children of their own. When we talked recently, one of the first things Michael told me is that he felt that there is still much to be done to better train teachers in Malawi. He hopes that a passion for teaching becomes one of the reasons young people choose teaching for their profession, not simply because there are many job openings for teachers in Malawi. He hopes that the training of teachers becomes more rigorous and of higher quality and that teachers are regularly monitored and assessed. He hopes that teachers will be dedicated to their students and work fervently to see these learners succeed. The graduate classes are underway again, and Michael feels refreshed after a few days off and ready to dig into some new ideas with his cohort. The courses this term are Contemporary Philosophies of Education, Organization and Operation of American Education, a tutorial in reading called, Means for Mastery of Reading Pedagogy, and Educational Research and Evaluation. Michael explained to me that all of the M.Ed. students are proposing thesis topics now and will read the existing literature. Then back home, they will undertake what is called “action research.” This means that they will all be working at their regular jobs in the TTCs, teaching future primary school teachers, and simultaneously collecting and analyzing their thesis data. They have a lot of work ahead of them. Regarding this, Michael is quite passionate.